Moon Lake Park is a place that seems forgotten. First established in 1968 and covering 800 acres, the park has clearly seen better days. Or has it? Even though its campground is shuttered, the swimming pool sits empty, and the tennis courts lack nets, in some strange way, this has only forced people to explore the hidden beauty of this once bustling park. Instead of families packed around the pool with the blaring whistle of a lifeguard, Moon Lake is now known for its miles a technical singletrack. It has become a prime mountain biking destination, with a web of trails that stitch the forest. Instead of concrete amenities, it is now the simple beauty of the park and its trails that attract people. Mountain bike trails are notoriously curvy and hard to navigate from a hiking perspective. While these trails are not ideal for hiking, they do explore some stunning places. The premier highlight at Moon Lake is along the Flume Trail, as it follows an abandoned aqueduct under one of the most impressive old growth forests in the region. We decided to do a quick hike along the Flume Trail and parked off of PA 29 in a dirt lot near Pikes Creek Reservoir. The skies were deep blue and the temperature was warm as Spring slowly made its presence known. The reservoir is part of a water supply, but shore fishing is allowed and we followed a trail to the shore. There we were treated to a beautiful sight as puffy clouds sailed across a deep blue sky, perfectly reflected by the still, clear waters. 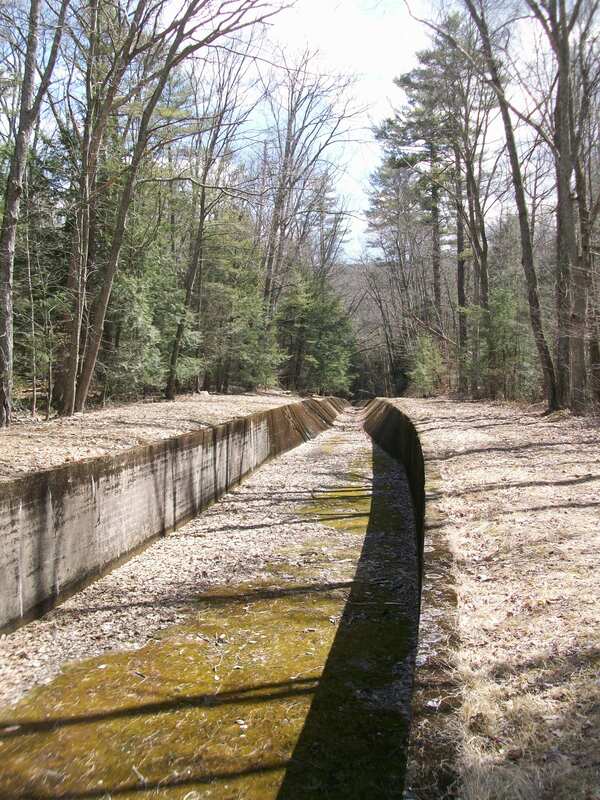 After crossing PA 29 and following the 5858 Trail, we reached the Flume Trail along an old, impressive concrete flume that once fed a waterworks. It is a fascinating man-made feature. The flume is still in excellent condition as it slides and curves through the forest, descending to a shallow pool and an old dam. The trail then followed the crest of an old aqueduct as it entered an ancient forest. The aqueduct collected some spring water, but otherwise sat empty. 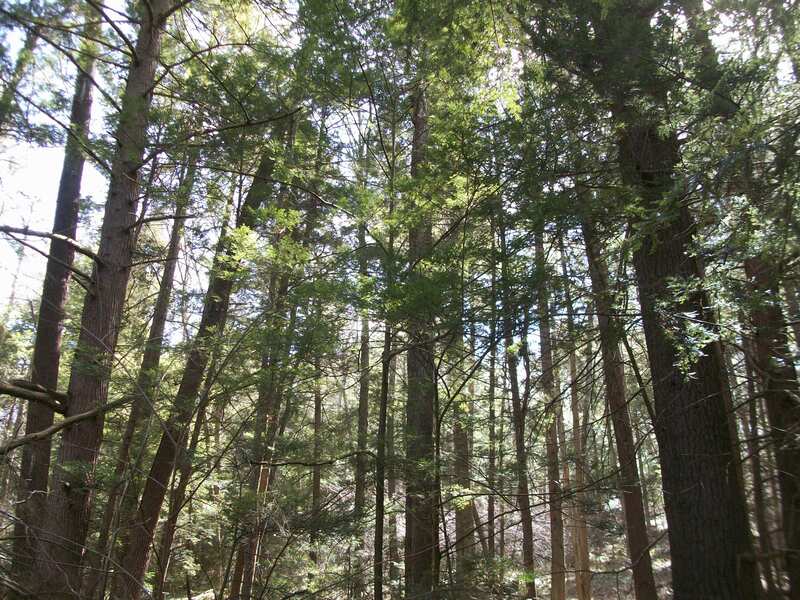 Giant trees of pine and hemlock towered through the canopy, as ferns and moss covered the forest floor. A small stream meandered along the bottom. Some trees were of impressive height. The aqueduct was still in good shape, other than its carpet of moss, and it appears it once fed the dam where the flume also entered. We explored this forgotten forest as shafts of sunlight divided the canopy of green. Maybe the forest’s salvation from being cut was that it was on watershed lands. We retraced our footsteps and returned to the car. We drove up to Moon Lake itself before heading home. While Moon Lake Park may never again be as popular as it was decades ago, popularity is not what makes it special. Moon Lake Park is described in Hike No. 19 in Hiking the Endless Mountains. 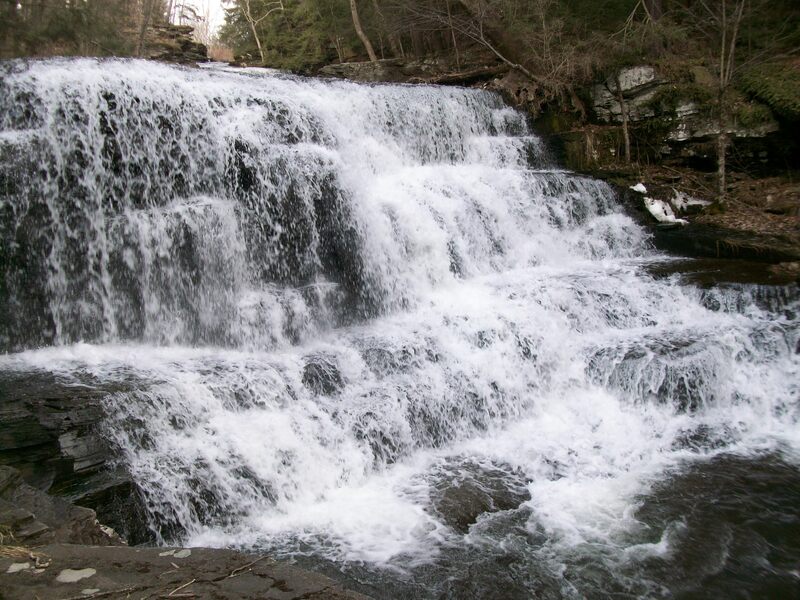 The small village of Falls is named after an impressive series of waterfalls along Buttermilk Creek that plummet to the Susquehanna River. The waterfalls are notable for their height and amount of water they can carry. Buttermilk Creek drains a sizeable area and in high water the falls are deafening. 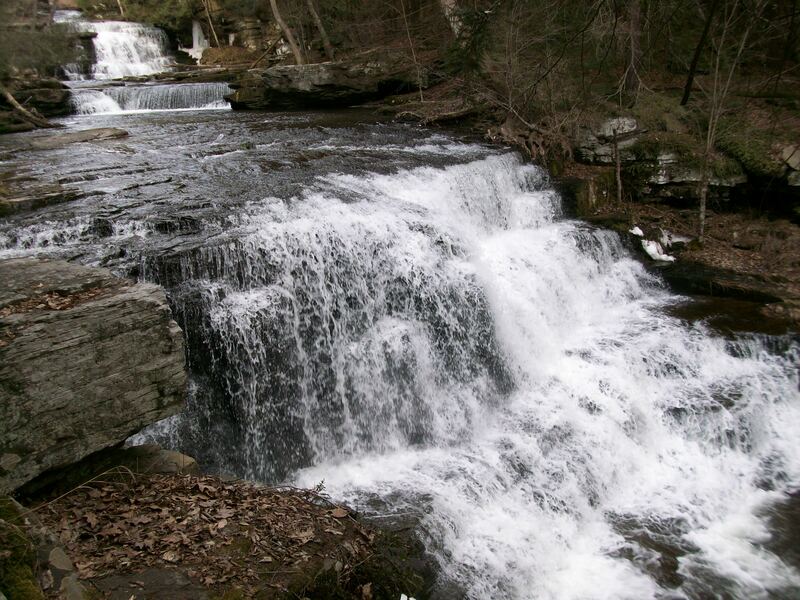 In fact, the falls are listed as an Outstanding Scenic Geological Feature by the Pennsylvania Geological Survey. The falls are on private property and the owner gave me permission to see them. Many postcards, especially older ones, featured the falls and I believe it was once a picnic area. Today, the falls are hidden from the road, guarded by giant white pine trees. The sight is immediately impressive, with two large waterfalls that empty into a deep pool, surrounded by ledges. Smaller cascades complete the scene as the creek stairsteps down the bedrock. More waterfalls are downstream. From the high mountaintops to the deep stream valleys, natural beauty can be found throughout the Endless Mountains. Panorama from the summit of Bald Mountain. Elk Mountain is to the far right. 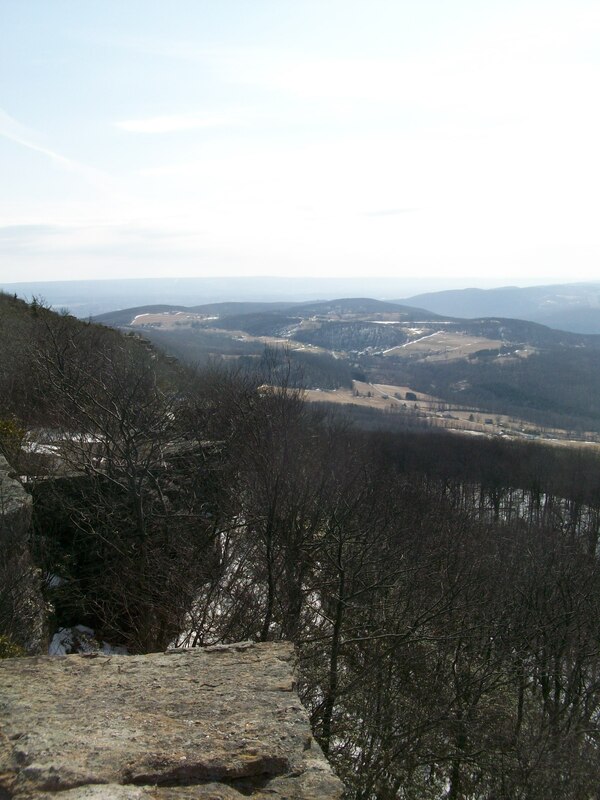 Pennsylvania has several summits named Bald Mountain, but none are quite as impressive as the one located just west of Scranton. This Bald Mountain features a rim of cliffs and talus offering incredible views in almost all directions, only the east is obscured by trees. When the leaves are off the trees, you can look down on Montage Mountain. The summit is comprised of a stunted forest, with twisted oak and birch trees, with some spruce. One ledge is a dramatic overhang, reminiscent of Virginia’s famous McAfee Knob. Views of North and Firetower Mountains. 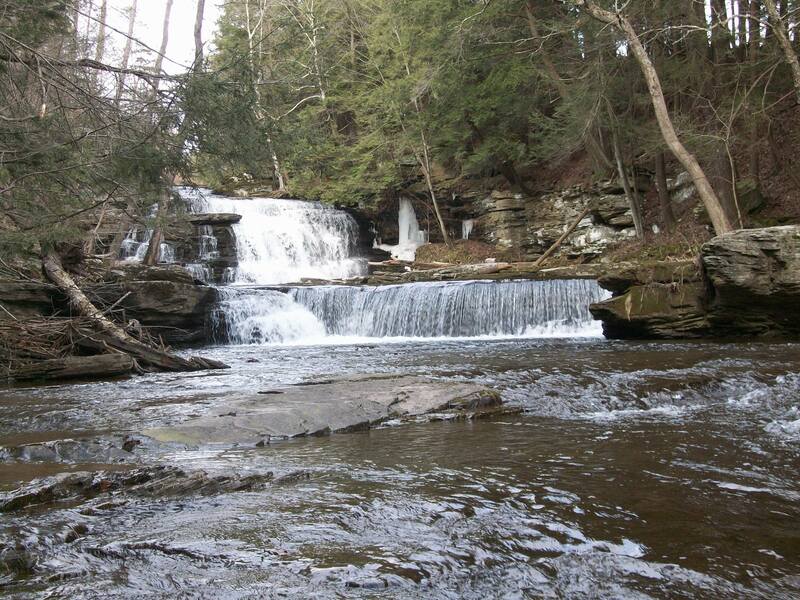 You can see the entire profile of the high plateaus, from Ricketts Glen to Mehoopany. 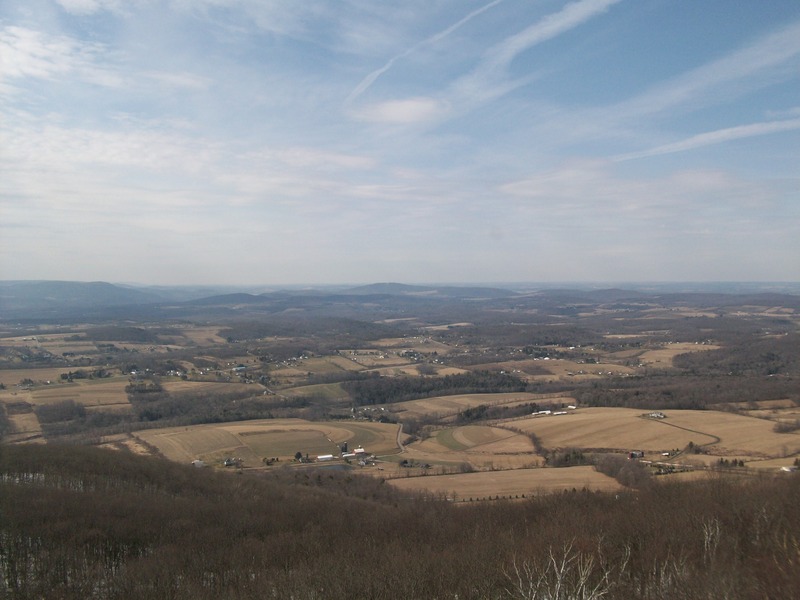 The views are surely among the best in the state, offering diverse scenery of farmlands, the twisting Susquehanna River valley, plateaus, distant mountains, and the ridges and valleys and Poconos to the south. The exposed ledges also feature many carvings, the earliest we found was from the 1880s. 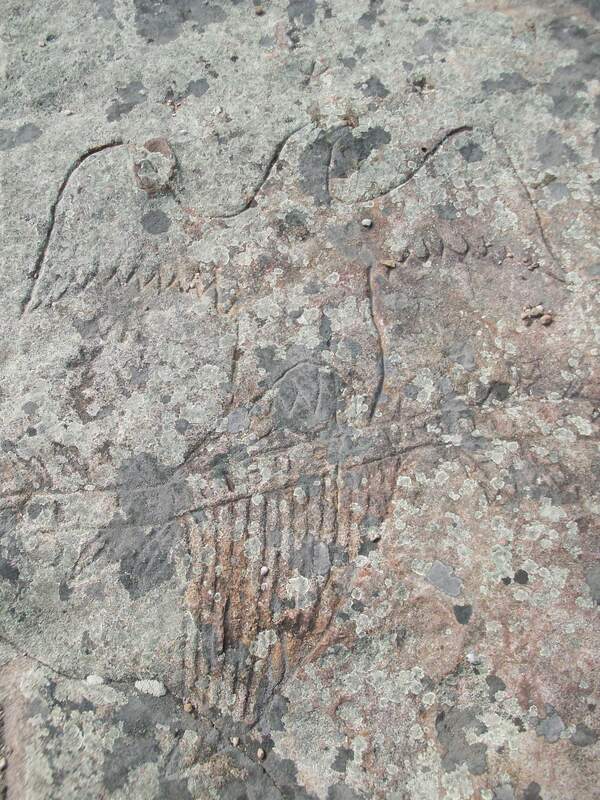 The most impressive carving was that of an eagle. I look forward to returning in the summer, when the view overlooks an ocean of green under blue skies, similar to what we saw from Osterhout Mountain, ten miles to the northwest. Osterhout or Shadowbrook Mountain in the center of the photo. 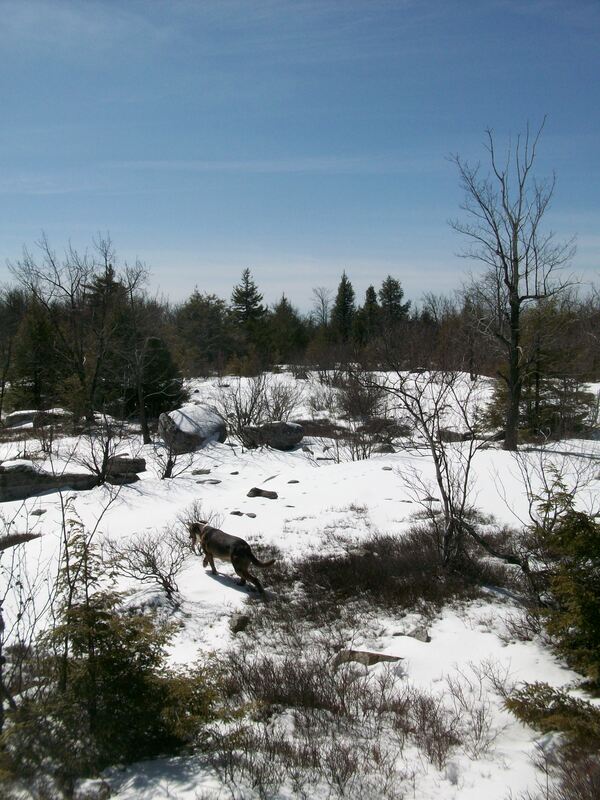 Ryan and I returned to SGL 57; our goal was to push even deeper into this wilderness and locate Wyoming County’s high point on Bartlett Mountain, which is just under 2,400 feet in elevation. This hike is in close proximity to hikes 12 and 13 in Hiking the Endless Mountains. The weather was incredible. Deep, sapphire blue skies stretched to the horizons. The sun was so bright as it reflected off of the snow. We began with the long hike up along Stony Brook. The streambed was devastated by the 2011 floods and several parts of the old road were obliterated. It is impossible to imagine the amount of water that tore down this gorge. As we gradually ascended, snow covered the ground. The trail entered a scenic grotto and deep hemlocks soon followed. We took a break near a meadow before continuing the trek up to Burgess Hollow Vista. 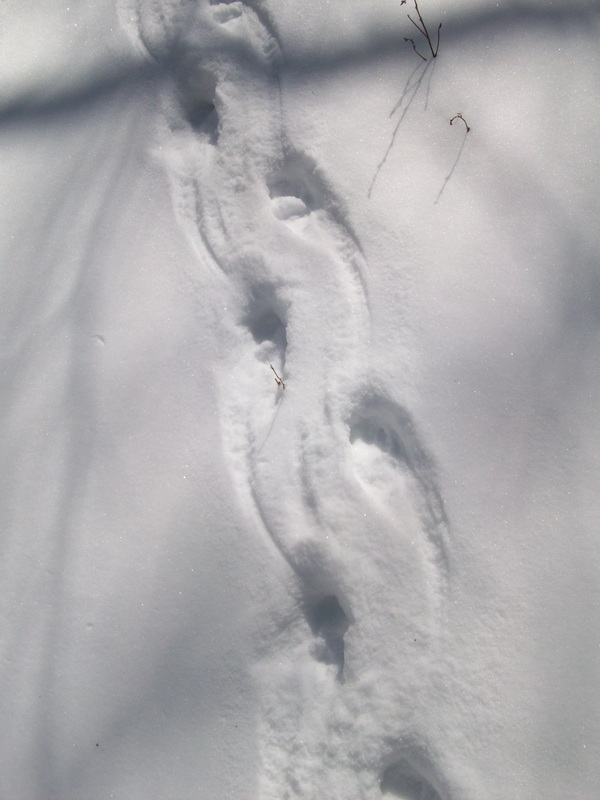 Along the way we saw the meandering tracks of some animal, as it crossed the trail repeatedly. 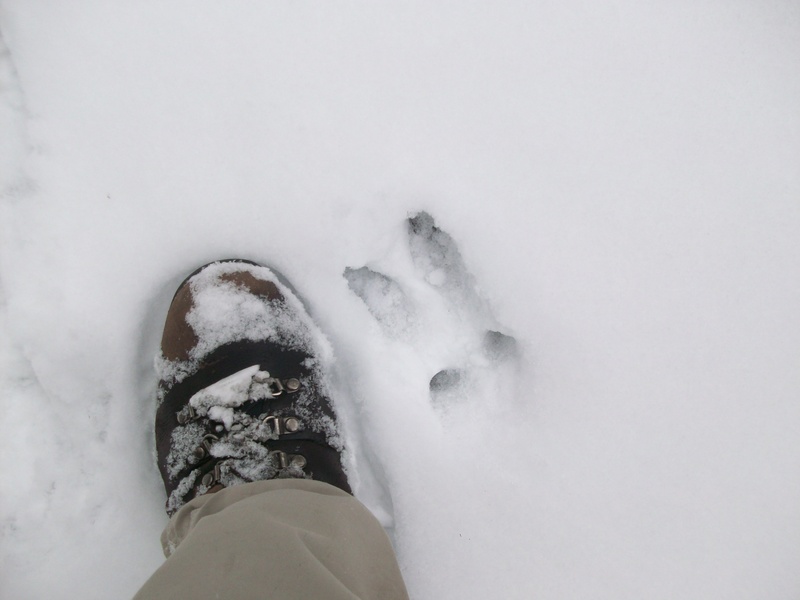 We thought it might be a bobcat, but the paws didn’t seem to match. We reached Burgess Hollow Vista with its 40 mile views. Elk Mountain rose in the distance. It was a beautiful sight. Now, our bushwhack began as we entered the forest and scrambled up snow covered ledges to some small spruce forests. The bushwhack proved to be easy as we gained elevation to another bald, and soon thereafter, an even larger one. Although there were no views, the feeling of isolation was incredible. Few people have been to these places. We headed south where we reached another bald and more spruce. A gradual climb followed to a prominent rock outcrop. I scrambled to the top. Below was a cave 40 feet deep that disappeared into a narrow crevice. I reached the high point. Stunted trees surrounded this bald, which was littered with rocks and pebbles. The sun blazed off of the snow and white bedrock. The rocks were in odd formations; we sat at one rock shaped like a wing, creating a small overhang. I had to keep my face in the shade to protect it from the blazing sunlight. We had reached the highest point in Wyoming County. Views could be seen through the trees to the northwest. Spruce and stunted trees. 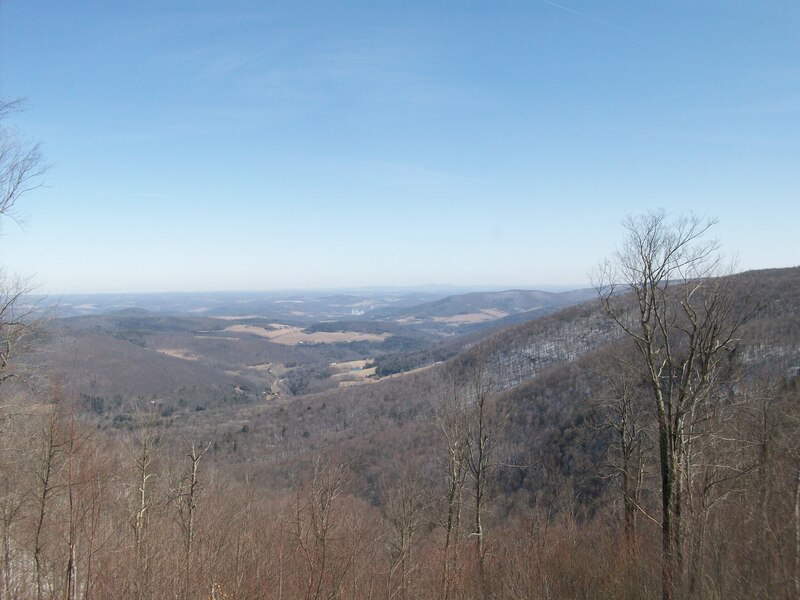 The highest point in Wyoming County on Bartlett Mtn. We followed a crest of ledges and smaller balds before cutting west through a deep hemlock forest, a treat in and of itself since the hemlocks are dying across much of Pennsylvania. We soon reached the Catlin Meadows, which is the source of Catlin Brook, a stream that plummets hundreds of feet down the plateau through a treacherous gorge filled with waterfalls. It is a remarkable place, but we could not explore it this time. Snow and ice would have concealed the falls and covered the gorge. The meadows were stunning, dusted with snow under blue skies, stretching for hundreds of feet in every direction. We made our way down to Stony Brook and one of my favorite spots, the Crystal Cascade. A deep, clear pool was at the base of the snow covered cascade. I was happy to see the cascades were not completely destroyed by the floods. A cool spruce forest followed, creating a dark tunnel of green. We reached Red Brook, also ravaged by the floods. The damage was incredible. The creekbed was about 8 feet lower than it used to be, with large trees thrown like matchsticks and boulders pushed in every direction. We crossed Stony Brook and made our way back to the cars, bringing an end to another memorable day in SGL 57 as we finally “bagged” the highest point in Wyoming County. It has been almost a year since I first explored the Bartlett Mountain Balds. Since that time, I’ve been to the balds about six times. It is a special place, where the forest opens to reveal and expanse of exposed, windswept bedrock, and teaberry and lowbush blueberry bushes that glow red in autumn. Views skim across the tops of the trees to reveal distant ridges. And deep, green, impenetrable spruce forests guard the balds. Its secret and kept by its isolation, as only the wind announces its presence as it surges through the trees with a distant, tidal rumble; its weight causes the forests to bend and groan. I recently returned to the balds and had the pleasure to bring Geren and Shannon with me. 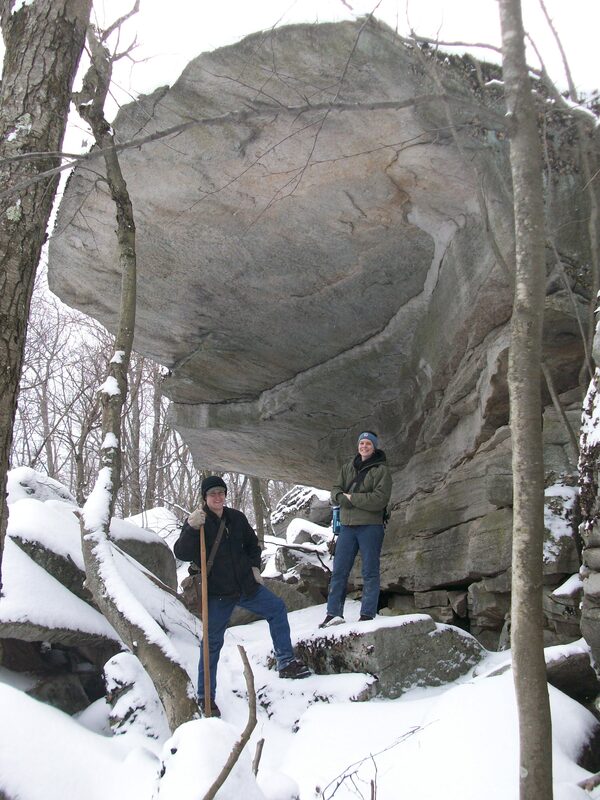 They enjoyed the hike, with jumbled rock boulders and overhangs, and the snow covered balds. This is a different world. The valleys had no snow, but almost 8 inches covered the mountain tops. Winter still holds firm on these islands in the sky. Heavy grey clouds sailed overhead as a lone hawk sped above us. Tracks of coyotes, raccoons, weasels, and a huge whitetail buck kepts us company in these lonely woods.